Let's delve a little further into the themes and styles of wedding invitations offered at Invitations by Dawn, shall we? Your wedding theme/style refers to the overall look you're trying to achieve. The colors, the decorations, the accents, the venue will all play an important role in revealing your particular sense of style and personalities. Unless you choose to order a save the date, the wedding invitation card is the first impression your wedding guests will have of your wedding and wedding look – make it a good one! 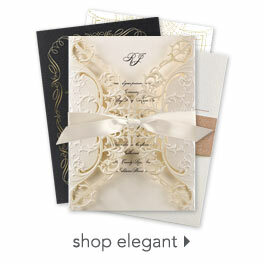 Invitations by Dawn is focused on bringing you the styles, designs, looks and themes you hold so dear to your heart. Your invitation is a reflection of the two of you; therefore, it must be unique in so many ways. Vintage wedding invitations are perfect for expressing your sophisticated style. Simple designs reflect an appreciation for minimalist style, whereas ornate motifs are well suited for refined artistic tastes. Beach, rustic, and traditional designs also speak to your likes, dislikes, your hobbies and who you are as a couple. Maybe you're more interested in the style of wedding invitation cards rather than the design itself. 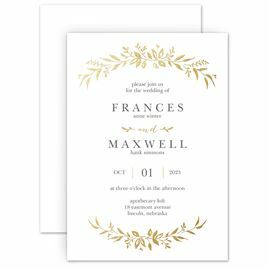 Browse through a variety of invitation pockets, layered invitations, square wedding invites and value options like seal and sends to find the right type of invitation for your event. 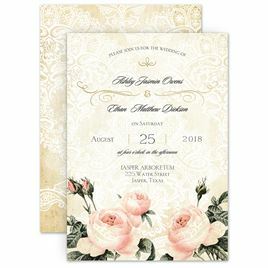 Creating unique wedding invitations is our specialty, but the printing processes we use are just as important as the designs themselves in bringing you great quality. We have more than 30 years of experience in the wedding printing industry, which has allowed us to perfect our traditional printing methods as well as develop new, exciting methods that result in beautiful quality for an affordable price. Our most popular printing method is digital printing, because it creates brilliant colors and designs within a fast timeframe. Thermography is a favorite among couples because it mimics the expensive look of engraving but for a much more affordable price. Our foil stamped wedding invitations feature a distinctly gorgeous look, and laser cut designs impresses even the most refined of tastes.